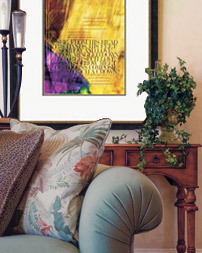 Your Hymnscript fine art print is delicate and should be handled as little as possible before you take it to be framed. When handling the print, be sure your hands are clean and dry. Oils and acids from your fingers can damage the paper and print area. If possible, wear clean white cotton gloves designed for handling art. Use both hands to support the print, and be sure to support the back of the print. Even heavyweight paper can bend easily, causing dents and creases that cannot be removed. Do not touch the surface of your print or try to blow away something on its surface. This can scratch the printed surface or expose it to moisture. Do not affix any kind of tape to the front or back of the print. Even removable note tags leave residue on fine art paper that is difficult or impossible to remove. Until you take the print to be framed, store it flat with the glassine slip sheet on the printed side. Keep your print in a dark, dry, cool room, away from food or drinks, curious children and pets, and any environmental contaminants like smoke or grease.